Liberal activists say she was complicit in an immoral migrant child separation policy — and should be ostracized by corporate America. 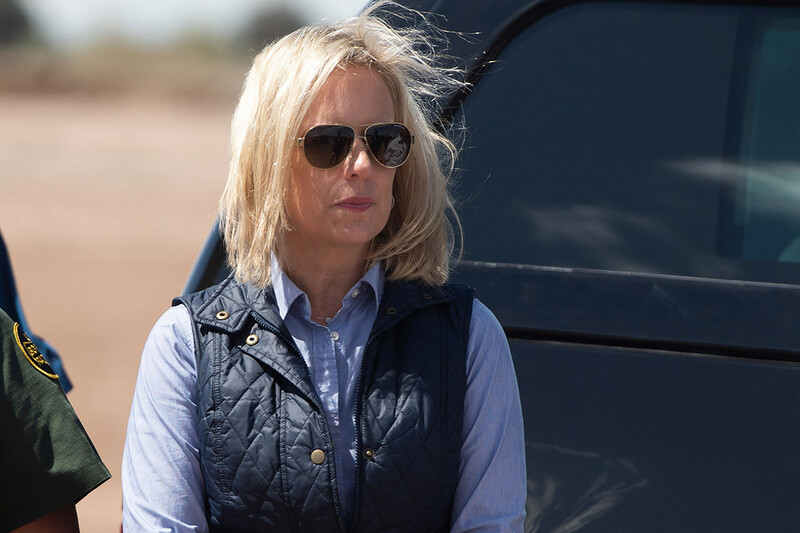 Kirstjen Nielsen’s image makeover has already begun—but it may be a hard sell. Just days after she announced plans to resign as Homeland Security secretary, Nielsen and her allies are working to rehabilitate her reputation, arguing that she’s not the heartless villain depicted by liberal critics already pressuring big companies not to hire her. Almost as soon as word of her resignation under pressure leaked, Nielsen’s allies began spinning a narrative of her tenure that casts her not as an enabler of President Donald Trump’s most controversial immigration policies, but as a guardrail against even more extreme action. In particular, they stressed that the policy for which Nielsen is most fiercely reviled — separating detained migrant children from their parents — gave her no pleasure, and that she slow-walked or resisted other Trump demands on border security. “I think Nielsen has been treated unfairly. A caricature was created by people who oppose the way the President talks about immigration or who even oppose current immigration law that’s been on the books for decades — and that caricature is nothing like the person she actually is,” said Thad Bingel, a former George W. Bush administration Homeland Security official who helped guide Nielsen through her Senate confirmation. But it will likely prove difficult for Nielsen to shed her unsavory image. Ultimately, she implemented the child separation policy and other controversial Trump moves rather than resign in protest, as many critics argued she should. And Democrats and their liberal allies plan to continue making her the face of what they view as one of the most outrageous periods of the Trump presidency. “She deserves accountability. She doesn’t deserve a big fat paycheck,” said Karl Frisch, spokesperson for the advocacy group Restore Public Trust. Cabinet secretaries, particularly ones at high-profile departments like DHS, typically go on to earn lucrative salaries with big corporations and Washington-based lobbying firms. The group has organized an open letter to top American corporations urging them not to hire Nielsen and other Trump administration officials. “She represents a severe reputational risk to anyone, any institution, that would engage with her,” Frisch said. Restore Public Trust is planning to launch a series of digital ads meant to hold Nielsen and other Trump administration officials involved in the family separation policy accountable. The ads will be targeted at K Street, Wall Street and Fortune 500 companies, according to a person familiar with the matter. Having defended the administration on Capitol Hill and stood alongside the president as he warned of a flood of dangerous immigrants coming into the country, Nielsen has become the face of the administration’s immigration policies. Her critics say images of minors being detained in fenced-in facilities along the border will dog her for life. Despite the ongoing effort to stigmatize Nielsen, two leading Washington-based corporate recruiters told POLITICO she will likely land a well-paid business job. But they both said her baggage could make image-conscious corporations, fearful of boycotts and Twitter backlashes, think twice about hiring her. The second recruiter noted that her experience with emergency management and cybersecurity issues could help her land lucrative consulting gigs. People close to Nielsen said she is still plotting her post-government plans. Her allies expect her to lay low for several months after she leaves DHS, as she recovers from an exhausting 16 months leading the agency. “I could see her getting into the cyber or risk resiliency sectors in corporate America because that’s her background before she came in, and obviously she did a lot of work on that in the department and the assumption is she will continue that work,” a senior administration official said. Nielsen’s last official public act will be speaking at a celebration of the brand-new DHS headquarters on Wednesday at the old St. Elizabeth’s Hospital site in Washington. She will speak without formal written remarks and may take the opportunity to reflect on her tenure at the department. Nielsen isn’t the first ousted administration official who has had to grapple with the reputational burdens of having served a controversial president. Indeed, several Trump White House officials have already laid out a possible path forward. Shortly after White House counsel Don McGahn left the White House in November, the New York Times reported that McGahn rebuffed Trump’s push to prosecute Hillary Clinton and former FBI Director James Comey. Some Trump officials interpreted the leaks as an act of image management by McGahn to show that he, too, was more a restrainer than an enabler of Trump. Some in Trump’s circle have privately stewed about what they perceive as McGahn and Kelly’s efforts to rebuild their reputation among the Washington establishment. They see echoes of that strategy in a series of recent leaks about the administration’s internal immigration debate that have painted Nielsen in a positive light. A CNN report posted the day after Nielsen’s resignation depicted her as telling Trump that closing ports of entry along the U.S.-Mexican border would be a “bad and dangerous” idea, as the story put it. Nielsen has few allies in the White House, where aides say she had an off-puttingly brusque style while serving as Kelly’s deputy in the chief of staff’s office. “She’s the face of it,” the former official added.